Just Genesis : Who was Eber? A great deal of speculation surrounds the biblical figure of Eber (Heber in the Septuagint). It is generally assumed that the word Hebrew is derived from his name. In 93 AD, Josephus wrote that the Hebrews were called after Eber (Antiquities of the Jews I, 6:4). However, this view of Eber as the eponymous ancestor of the Hebrews is problematic since the Genesis genealogical material makes it clear that Eber is a descendant of both Ham and Shem and the father of both Afro-Arabians and Afro-Asians. It is much more likely that the word Hebrew is derived from Habiru or äapiru, referring to a caste of ruler-priests who dominated the Afro-Asiatic Dominion. The Habiru served at the Sun Temples (O-piru) which they constructed from the Nile to Cambodia. 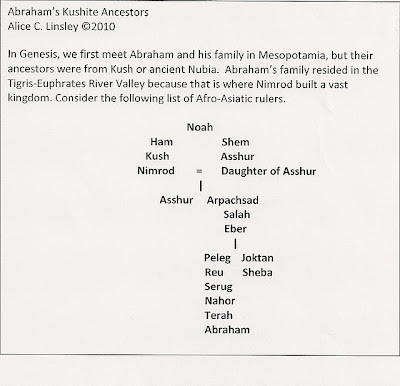 Abraham's ancestors were Habiru. The word Hebrew (hbr) comes from the word Habiru (hbr), not from Eber. Hapiru (Akkadian) and Habiru (Kushitic) are related to the Arabic yakburu, meaning “he is getting big” and with the intensive active prefix: yukabbiru means "he is enlarging." This is a reference to the morning ritual of the Horite priests who greeted the rising sun and watched as it expanded across the horizon. 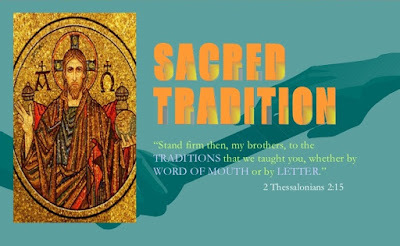 The Egyptians called the temple attendants ˁpr.w, the w being the plural suffix. The Horite east-facing temple was termed O-piru, meaning Sun House. Eber was the father of two first born sons by his two wives. Joktan was the son of his cousin wife and the heir to the throne of Eber's father-in-law in Southern Arabia. Joktan was the founder of the Joktanite clans of Arabia and Abraham's firstborn son was named Joktan after this famous ancestor. Peleg, in whose time the "earth" was divided, was the heir to Eber's throne in Northern Arabia and probably ruled part of Mesopotamia. He was the son of Eber's half-sister wife. This aligns with the marriage and ascendancy structure of Abraham's Kushite ancestors. Eber's sons became the founding patriarchs of two linguistically distinct Afro-Asiatic groups: the Afro-Arabians and the Afro-Asians. Apparently, the Kushites became divided linguistically after the time of Eber's death around 2303 BC. According to the Hebrew Bible, Eber died at the age of 464 (Gen. 11:14-17). In the Septuagint, Heber is said to have lived to an age of 404 years. The Hebrew Calendar places Eber's death at 1817 BC, which is unlikely since Abraham lived about 2100 BC. 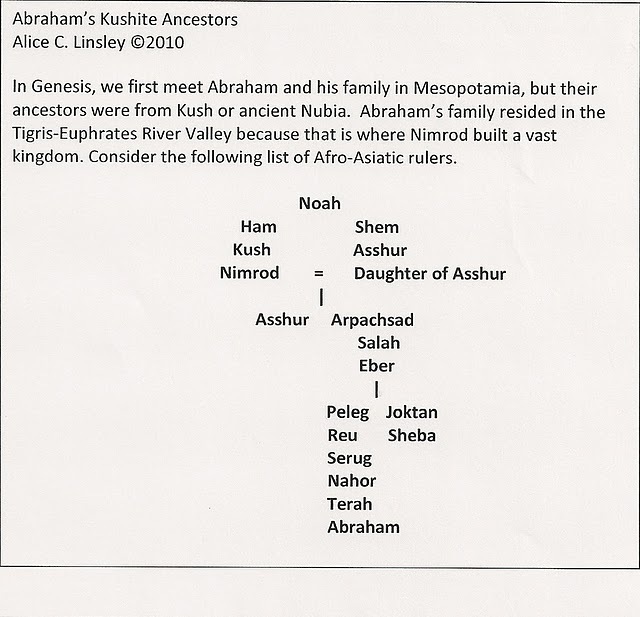 Genesis 10:21 lists Shem as Eber's ancestor, but Eber is also a descendant of Kush as the royal descendants of Ham and Shem intermarried. That Eber was a great ruler is attested in the pre-canonical Girgam (Diwan) where his name appears as Abir ;and he is designated Amir, ;the Arabic word for commander or ruler. As the Kushite ruling lines intermarried exclusively, Eber was a descendant of both Ham and Shem. The Genesis genealogical material indicates that Eber married the daughter of Joktan the Elder. She was his cousin bride and named their firstborn son Joktan, after her father, according to the cousin bride's naming prerogative. Joktan is Yaqtan in Arabic. 1. 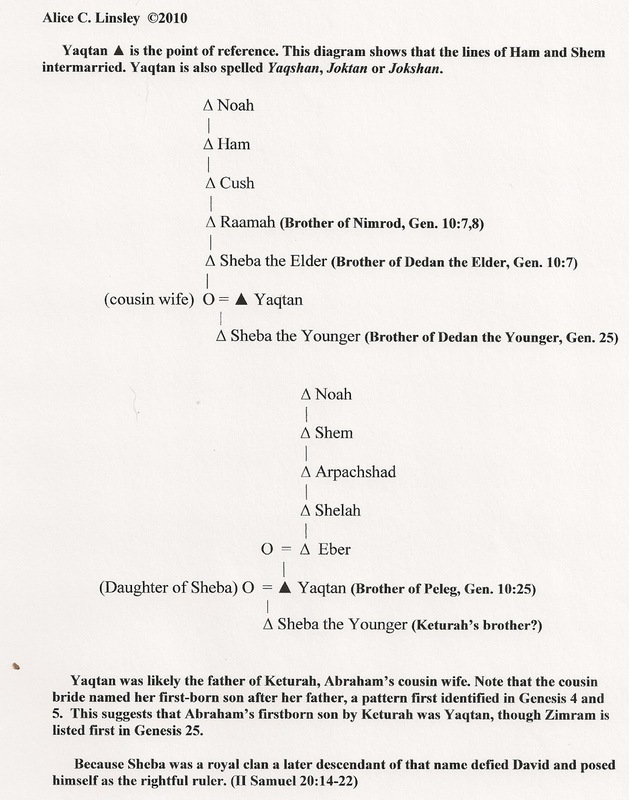 The Diagram on this post which is centered on Yaqtan, father of Sheba the Younger (who probably as well was the father of Keturah, Abraham’s cousin wife), is suggestive of the idea that Sheba persisted as a royal clan, and that a later descendant of the clan by that name would assert a claim on the kingdom whose throne came to be occupied, in such time, by David son of Jesse (II Samuel 20:14-22). 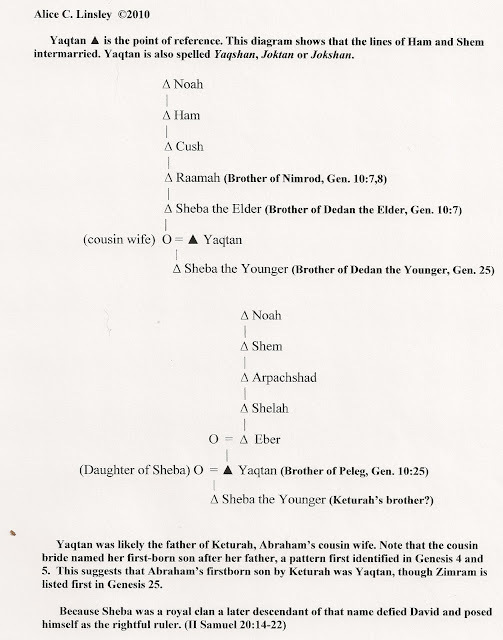 Can we conclude that the unnamed female figure in this Diagram, which you identify as a “Daughter of Sheba” is in some way equivalent to the title “Bath-sheba” (II Samuel 11:3), the wife of Uriah, who became by union with David, the mother of Solomon; so that “Bath-sheba” would probably have been known by her contemporaries to have been an heir in some way to the other Shebas mentioned -- Sheba the Elder, Sheba the Younger, and to their descendents after them who figure in the siege of Abel of Beth-maachah episode (II Samuel 20:14-22)? 2. What do you make of the appeal by the “wise woman” in II Samuel 20:16-18? Especially her cryptic words of warning to Joab about how he should beware of destroying a “mother in Israel” because he might thereby be culpable of swallowing up “the inheritance of the LORD”? Do you find her “wisdom” here to be resonant with the assertions you have been making about how persistently maintained were the people’s expectations in the promised Seed of the Woman (Gen. 3:15)? In that, the wise women in this episode, before offering up the head of Sheba to Joab, went around and shared “her wisdom” with the people of the city: What was she, some kind of prophetess? Jonathan, You are asking great questions! I hope that I can answer them, at least partially. Sheba was a royal house before David's time. The first Sheba of Scripture lived 4 generations after Noah. Bath-Sheba does mean "daughter of Sheba" and was a designation of her noble lineage, not her given name. The House of Sheba and the House of Dawoud (David) are closely aligned throughout Scripture. You remember that the Queen of Sheba visited Solomon. You have it exactly right about the Wise Woman of Abel Beth-Maccah. She was warning Joab that the killing of the women of her ancient town, where Sheba sought refuge, threatened the coming of the divine Seed who the wise ones believed was to be born of the ruler-priest lines. Sheba's ruler-priest line was connected with Jerusalem, since it appears that Melchizedek, the King of Salem, was the son of Sheba the Elder. (I address this in tomorrow's post.) This explains why Sheba felt justified in contending against David for the throne in Jerusalem. Why could not Eber be eponymous ancestor of both Hebrew and Apiru? The Eber tribe of SW Arabia were an afro/arabian combo which would conform to your diagram. Some or most of these tribes adopted an economic strategy of raiding neighboring clans for "wives" and cattle which fits the description of Apriu. Trader priests or merchants would also conform to the "unsettled" lifestyle of bands of men without familial ties (Apiru). Merchant, merchandise, mercenary, market and commerce may all be from the same root word m'karib. Makarib was the title of the first kings of Saana. Also, moakhar is South Arabian word for "bride price". Yes, Eber could be both. I lean away from his being the eponymous ancestor of both, because the priesthood that served at the O-piru existed before Eber's time.